MONTREAL, March 26, 2019 /CNW Telbec/ - The Air Canada Foundation is pleased to announce that, to further strengthen its partnership with Children's Miracle Network (CMN), all funds raised in 2019 on board Air Canada and Air Canada Rouge flights through the "Every Bit Counts" program will be remitted to the 14 CMN paediatric member hospitals in Canada. "Over the years, Air Canada and the Air Canada Foundation have made a direct impact in local communities across Canada through a unique combination of grants to children's hospitals, airline tickets and Aeroplan Miles donations. We are proud today to expand even further our support to the Children's Miracle Network and its member hospitals" said Priscille LeBlanc, Chair of the Board, Air Canada Foundation. "Through the Every Bit Counts program Air Canada customers have the opportunity to make a difference in the lives of children by donating spare change they no longer need. We thank them for their generosity." The Air Canada Foundation, a registered charitable organization, is dedicated to helping connect sick children to the medical care they need, making their wishes come true, and alleviating child poverty. Each year the Air Canada Foundation supports hundreds of charities focused on the health and wellness of children and youth in Canada. In an effort to help more children, the Air Canada Foundation facilitates the donation of currency of any denomination collected in-flight or in receptacles in select Maple Leaf Lounges. Air Canada and Air Canada Rouge passengers who wish to donate may locate a collection envelope in the seat pocket in front of them or ask a flight attendant. 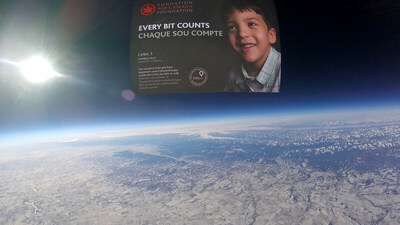 The Air Canada Foundation's objective is to raise $300,000, through the Every Bit Counts program, an increase of over 15% from last year. In 2018, the Air Canada Foundation granted over $5.4M in support (financial and in-kind) to Canadian registered charities dedicated to improving child health and wellness across Canada. "Thanks to Air Canada and the Air Canada Foundation's generosity, and that of their employees and passengers, CMN member hospitals received, over the course of our proud, ongoing 26-year partnership, critical funding necessary for specialized pediatric equipment and services that accelerate recoveries, shorten hospital stays and get kids back to living the childhoods they deserve. Their commitment to the health and well-being of children has greatly helped develop innovative advances and incorporate aspects of childhood into pediatric care that give children a respite from treatment and a return to childhood," said Mark Hierlihy, Canada's Children's Hospital Foundations. In addition to the Every Bit Counts program, the Air Canada Foundation raises funds through a number of initiatives including its annual golf tournament and the Wanderluxe gala. With its Hospital Transportation Program, the Air Canada Foundation also lightens the financial burden frequently linked to the hospitalization of sick children who require access to medical care they need away from home by donating millions of Aeroplan Miles to Canadian pediatric hospitals. Children's Miracle Network® raises funds and awareness for 170 member hospitals, 14 of which are in Canada. Donations stay local to fund critical treatments and healthcare services, pediatric medical equipment and research. Its various fundraising partners and programs support the non-profit's mission to save and improve the lives of as many children as possible. Find out why children's hospitals need community support, identify your member hospital and learn how you can Put Your Money Where the Miracles Are, at www.childrensmiraclenetwork.ca.